So what are these American strategic interests? Let’s spell it out, shall we? The United States underwrites the global economic order by the force of its arms. The imperative is to ensure the global oil supply, and to keep the world strategically unipolar. 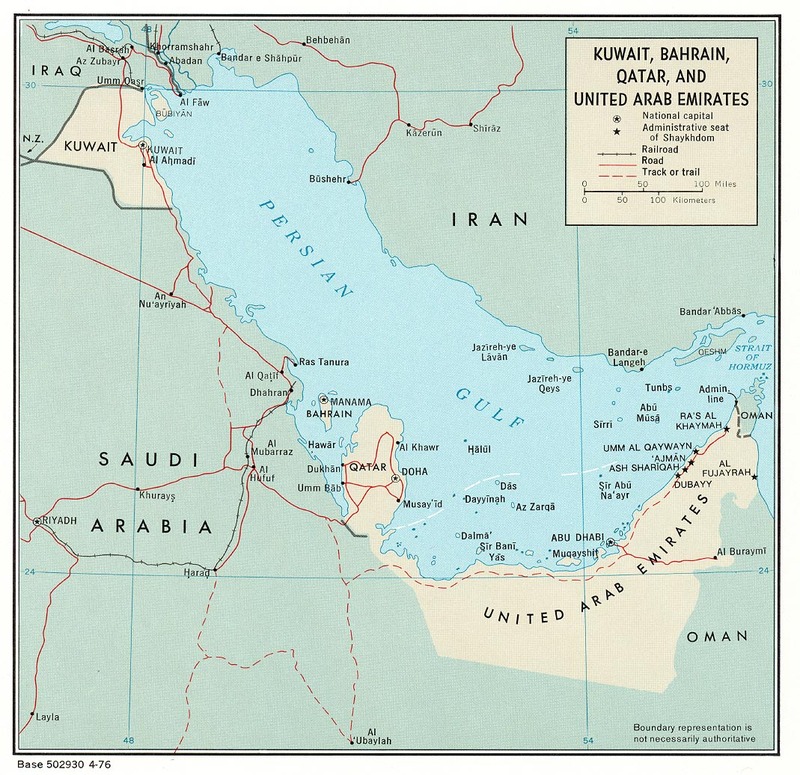 Control of the Persian Gulf is crucial to U.S. planners, it is required to underwrite the veto. This makes the global order stable and is a force for good. The markets need it to stay over water. Everyone benefits from a growing global pie and so on and so forth. Fine, let us call it by the technical term ‘stability’, and agree to accept it for the remainder of this argument. So what is the problem with U.S. strategy? The strategy is based on the incorrect assumption that Shi’ite mobilization for democratic rights in Bahrain, Yemen, Iraq, Syria, Jordan, Saudi Arabia and Lebanon is antithetical to stability. Its based of the intuition that democratic regimes in Shi’ite majority countries will naturally ally themselves with Iran by sectarian gravity, or be ‘unstable’ in some other way. That it will destabilize surviving Arab petro-dictatorships with large Shi’ite minorities. Democratic emancipation of Shi’ites outside Iran will, a priori, undermine the horrible Islamic regime and its efforts to crush its own democracy protestors. If done right, it can even nudge the regime over the precipice and usher in a green revolution in Iran. This of course depends on what kind of regimes emerge in these places. What kind of elected governments can we expect in the Shi’ite majority countries? Would Turkey style democracies, i.e., with the military firmly allied to the U.S. that guarantees policy bounds and understands U.S. strategic interests, be a problem? Not really. Certainly such regimes will be a boon to ‘stability’ in the region. Note that it hardly matters whether the potential elected governments are Islamist or secular. What matters is whether they are stable or display too much autonomy. The Egyptian example here is illuminating. The United States ensured that the Egyptian military will remain on board. In particular, it would not tolerate a radical government. Its clear that the U.S. can ensure the same outcome in the Shi’ite majority countries short of the possibility of the emergence of a radial Islamist regime in one of these places. Here the numerical sectarian divisions in Bahrain, Yemen, Iraq and Lebanon guarantee that their respective militaries will be able to ensure stable, multi-sectarian regimes. There is always the possibility of sectarian strife, but the U.S. can at least guarantee that no radical, anti-American regimes will emerge. In fact, note that the possibility of rising sectarian violence clearly goes up with U.S. supported Arab state terror. The Shi’ite are natural cultural allies of the West, way more than the Wahhabis in Saudi Arabia. If the U.S. promotes the emergence of stable, democratic regimes in places where the Shi’ite are numerous, a democratic regime in Iran is more likely to be ‘stable’. On the other hand, if it continues to support the brutal suppression of Shi’ite democracy agitators by Arab dictators, the emerging Iranian regime is likely to be more antagonistic. Moreover, it will complicate U.S. exit plans in Iraq by increasing the support for Shi’ite radicals, and certainly be a boost for Hezbollah in Beirut, and rebels in Yemen. Policy makers are understandably concerned about destabilizing surviving Arab petro-dictatorships with large Shi’ite minorities. By now it is clear that some amount of democratic participation is going to happen, even in Saudi Arabia. We will probably see more Turkeys emerge, certainly to be expected in the case of Egypt and Tunisia. Some observers think that there are no more dominos to fall. I do not think that things have settled down just yet. In any case, some concessions on democratic rights will have to be made in the other regimes as well. If the U.S. pressures the Arab regimes to ensure Shi’ite rights and participation, it will make these countries more not less stable. Obviously, the Arab dictators will not like it. Tell them to hold their noses. Remind them how stability pays for their 500 foot yachts. The way things are going right now, we are going to see a repeat of the 1980s when the U.S. armed and backed Saddam in his war against Iran. But trust me, you do not want Saudi Arabia fighting Iran. $200 a barrel would be a steal. If they attack Iran without U.S. authorization and support, their oil fields are too exposed to a conventional Iranian response. They are bluffing, and all their belligerence will evaporate without U.S. support. The U.S. is not really responsible for events in Libya. [Even though I could be persuaded to support a surgical beheading strategy]. It is most responsible for places where it exercises most control. The same goes for the attentions of public intellectuals. The overall emerging order in the Middle East and North Africa is certainly not controllable. In fact, the democracy wave seems to have been completely unanticipated. So it is perhaps natural that the Obama administration and U.S. planners are like deer caught in the headlights. They are sticking to old rules of the game out of sheer inertia or perhaps an inability to comprehend the implications of unforeseen events. The irrational fear of Shi’ite mobilization is hindering clear thinking. It might have something to do with the fact that all inhabitants of the White House have recurring nightmares about the events of 1979. Things are complicated in Iraq and Yemen et cetera, but Bahrain is a pure case. There is zero potential of a regime antagonistic to U.S. interests because the dominant Sunni elite comprise a third of the population. The island is not even remotely a potential threat to global oil supply or U.S. dominance of the Persian Gulf. On the other hand, a prosperous Shi’ite-majority democracy right on their doorstep could possibly undermine the Islamic regime in Iran. There is very limited downside and a huge potential upside. Exactly the hedge you need President Obama. [Update: Even as public attention is sharply focused on Japan and U.S. airstrikes in Libya, some observers are keeping track of Bahrain. At the Guardian, Shirin Sadeghi talks about the fabrication of Shi’ite-Sunni divide. Mark Lynch over at Foreign Policy, elaborates the Saudi strategy and sectarian framing of the issue at hand. Nicholas D. Kristof pulls a Kristof on his column. Don Zakheim at Shadow Government addresses politics of stability in Bahrain.